If you are ready to resign from your current position and you are regretful about this but know it is the right decision to make then sometimes this can be the hardest form of resigning from a position because in actual fact you are sorry to be actually leaving, it is just the time is right to move on and at some point this happens to everyone. Gather the facts you need to be able to write your resignation letter including your notice period and anything that you need to inform your employer of or arrange to give back etc upon leaving the company. If you are now ready to start writing this letter, please see the below example which you can use as a guide. 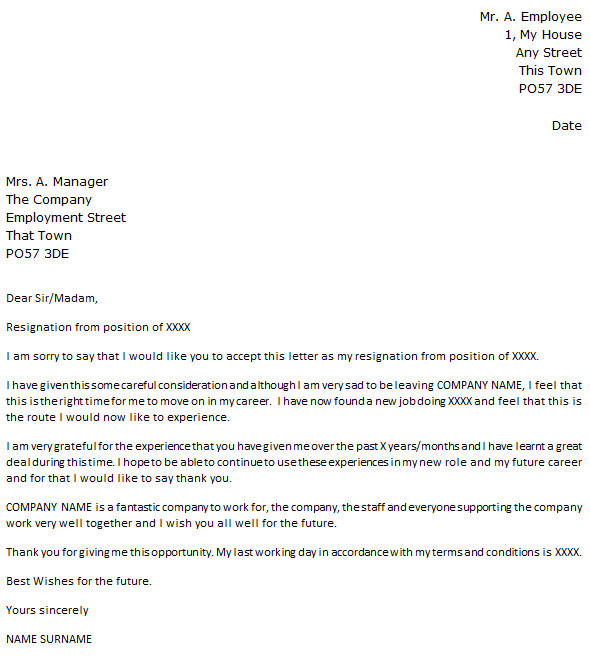 I am sorry to say that I would like you to accept this letter as my resignation from position of XXXX. I have given this some careful consideration and although I am very sad to be leaving COMPANY NAME, I feel that this is the right time for me to move on in my career. I have now found a new job doing XXXX and feel that this is the route I would now like to experience. I am very grateful for the experience that you have given me over the past X years/months and I have learnt a great deal during this time. I hope to be able to continue to use these experiences in my new role and my future career and for that I would like to say thank you. COMPANY NAME is a fantastic company to work for, the company, the staff and everyone supporting the company work very well together and I wish you all well for the future. Thank you for giving me this opportunity. My last working day in accordance with my terms and conditions is XXXX.